Wine for the Holidays with Bill Dunn: Part 4 on "Talk of the Town with Tom Pace"
“Fine as Wine.” Seems I’ve heard that expression all my life, but never realized how true it was…and, still is, today. When I was with Bill Dunn, sampling some of finest wines ever, I learned just how important, the many ingredients are that go into growing the grapes of highly-respected wines served in most of the best restaurants. You remember Bill, he’s the Fine Wine Specialist from Republic National Distributing Company, in Shreveport. Now it’s time for the Final installment of my 4-Part Podcast fine wine series on the “Talk of the Town with Tom Pace” titled: Wine for the Holidays. Bill Dunn wraps up the series with his description of the dark, ruby-red port wines…and how the different wineries have their own unique brands and labels. Most of all, you’ll come to appreciate, like I did, the stories of many of the most well-known wines from ‘round-the-world. 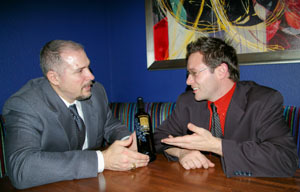 You’ll notice many of the pictures here, show Restiorante’ Giuseppe’ General Manager Dave Luebertt, sitting with Giuseppe’s co-owner Gio Brucia, talking about some the Trinchero Family Estates fine-wines they serve every night. 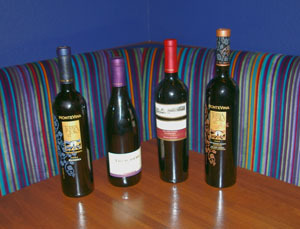 Take note of the wines pictured on the table at Ristorente’ Giuseppe, from left to right: the 2003 Montevina Terra D’oro Barbera (Amador County); next to the 2006 Trinchero Family Pinot Noir from Napa Valley, followed by the 2005 Trichero “Chicken Ranch Vineyard” Cabernet Souvignon; and, finally at the far right, there's the 2005 Montevina Terra D’oro “FORTE” (Amador and Napa Valley). These are but a few of the fine wines, served at Ristorante’ Giuseppe’, in Shreveport’s Uptown Shopping Center. 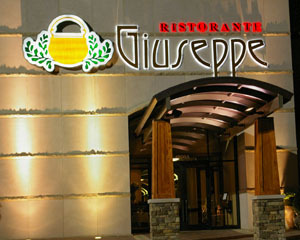 Owned and operated by Gio and Natalie Brucia, Giuseppe’s recently celebrated their 1stAnniversary December 15th, 2007. My recommendation: if you’re looking for a very intimate table-for-two, complete with candlelight, or that exquisite grand dining room, complete with that crackling fireplace, remember to call 318-869-4548, and make your reservations today. Chio, Tom.